The quake registered 5.5 on the moment magnitude scale and hit at around 5pm GMT. 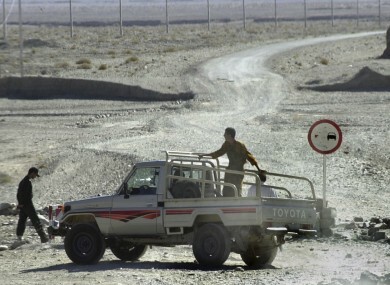 File photo of the Afghan border in Iran, near the area where the earthquake struck today. FIVE PEOPLE HAVE been killed today and at least a dozen injured in a moderate earthquake that struck eastern Iran near the Afghan border, a provincial emergency official said. “Based on the latest reports from the scene, the quake killed five people and injured 12 others,” Mohammad Ali Akhoundi, head of South Khorasan province’s crisis management service, told Mehr news agency. The quake, which registered 5.5 on the moment magnitude scale, hit at around 5pm GMT. Its epicentre was 25 kilometres from Zohan, a small town in the province, according to Tehran University’s Seismological Centre. Five villages were also “destroyed or damaged” in the quake Akhoundi was also quoted as saying by the state broadcaster IRIB. Iranian media reports said search and rescue teams were dispatched to the area, which had lost communication. The US Geological Survey, which monitors earthquakes worldwide, confirmed the temblor saying it measured 5.6 and was at a depth of 5.4 kilometres. Zohan is about 810 kilometres southeast of Tehran. Iran sits astride several major fault lines and is prone to frequent earthquakes, some of which have been devastating. In December 2003, a quake measuring 6.6 on the Richter scale struck the southern city of Bam. It killed 31,000 people – about a quarter of the population – and destroyed the city’s ancient mud-built citadel. Email “Iran earthquake kills five, destroys villages in rural area”. Feedback on “Iran earthquake kills five, destroys villages in rural area”.